Austin Hardcastle stood pensively next to a giant poster explaining his research, the ultimate in “How I Spent My Summer Vacation” reports, holding the malaria test he designed. Soon, the School of Engineering’s faculty would pour out of a meeting in Featheringill Hall and walk past Hardcastle’s poster and 33 others, asking tough questions and handing out congratulations. It was all part of the Vanderbilt University School of Engineering Summer Research Program, which grants students from Vanderbilt and other universities a $5,000 stipend to spent 10 weeks paired with a faculty mentor on a research project. This year, the School of Engineering funded 40 slots, and faculty members funded 19 more. Nearly 200 students from across Vanderbilt and other universities applied for those. 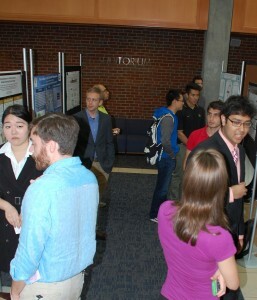 On Sept. 3, participants explained their work to poster session visitors. School of Engineering Dean Philippe Fauchet congratulated them and handed out certificates. When Hardcastle (BME’18) found out about the program, there was no question whether he would apply. He was interested in being mentored by Professor of Biomedical Engineering Rick Haselton, who specializes in diagnostic technologies. Hardcastle’s malaria test runs on machinery similar to a music box — making it useful in developing nations where resources are scarce — and can detect malaria in a smaller blood sample than traditional tests use. 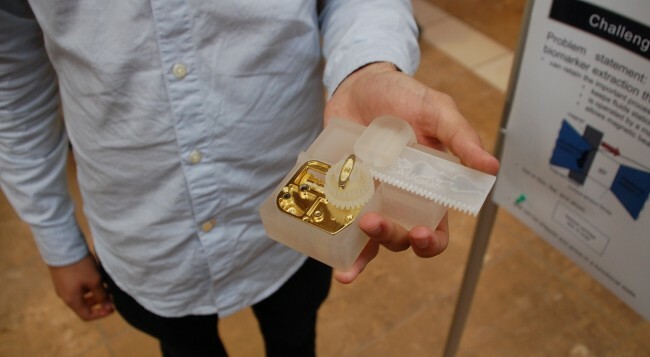 He built it on a 3D printer. Undergraduate researchers explain their work to other students. Matt Lang, professor of chemical and biomolecular engineering and chair of the Faculty Research Council, said the program is invaluable for everyone involved. Lang mentored two Vanderbilt students and one from Colgate University. At the poster session, he also thanked Doug Adams, Daniel F. Flowers Professor and chair of the Department of Civil and Environmental Engineering, and Bennett Landman, assistant professor of electrical and computer engineering and computer science, for taking on several mentees apiece. One of those in Adams’ lab was Christine Smudde (ES’17), who said she’s interested in studying materials science as a graduate student and thought the summer research program would be a good way to explore the discipline in advance. Her project explored the possibility of using nanocrystals to better track the time it takes to cure materials – research that could have huge implications in manufacturing. She found the presence of nanocrystals themselves affected the cure rate, so further research is needed. Madeline Girard with her poster. After winning a slot in VUSESRP for Summer 2014, Madeline Girard (BME’16) was eager to experience it again. 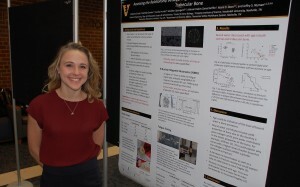 This year, Research Assistant Professor of Biomedical Engineering Jeffry Nyman mentored her, and she investigated bone water in cortical and trabecular bone samples from cadavers. She learned that water decreases as age increases.